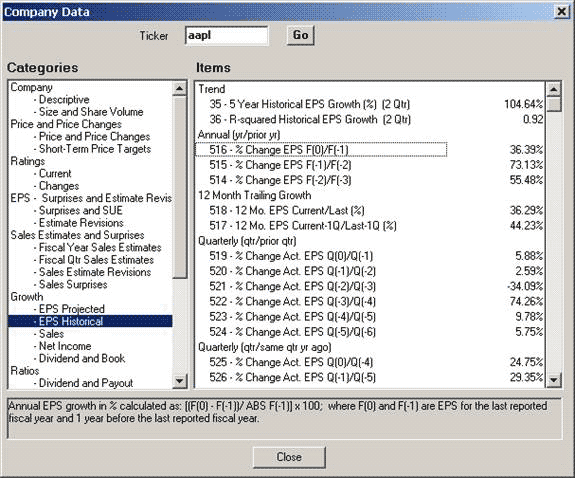 The Research Wizard makes it quick and easy to access all of a Company’s stock data with a click of a mouse. 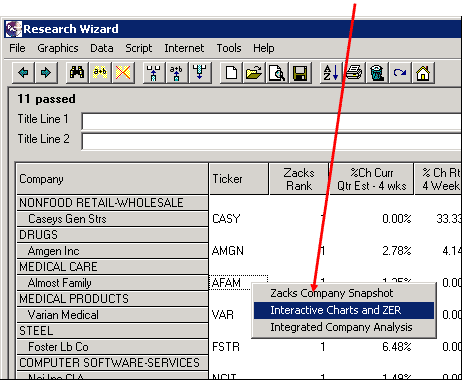 Any data, within the Research Wizard’s universe of stocks, is only a click away. Below are some quick tips on some of my favorite (and lesser known) ways to put all of this data at your fingertips. This is probably my favorite way to quickly see any piece of data I want for any stock almost instantly without having to run a screen. From the Menu Bar, click on Report and then Company Data. The Company Data window will then pop up. You’ll notice that all of the Categories and all of the Items that are available from the main page are available in this window too. 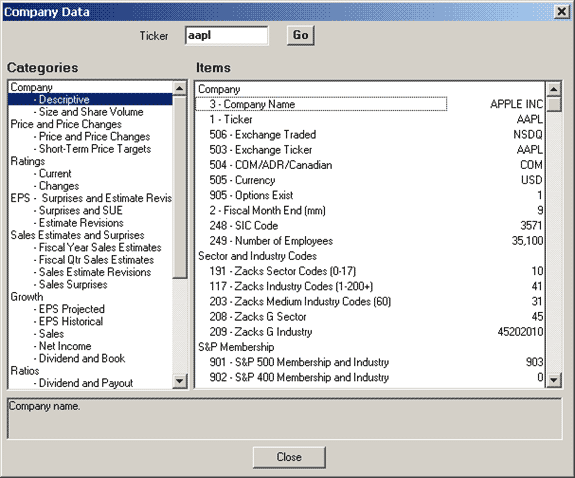 Now, you’ll be able to see all of the data values for all of the items for this stock with a simple click of the mouse. In the above image, all of the data for all of the items associated with the selected category (e.g., Descriptive) is displayed. Select a different Category, and all of the values for those items will be displayed. Note: the numbers preceding each item is simply the item’s numerical identifier and is not an item’s value. These identifiers are how the database identifies an item and how an item in represented in a Calculated Expression. 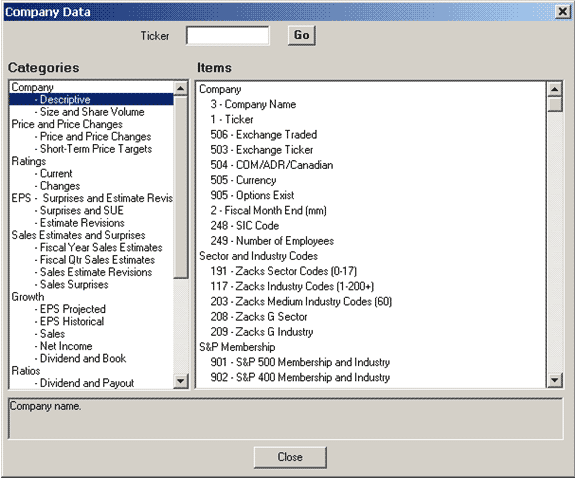 The next time you need to quickly access a certain data point (or points) for a stock, try using the Company Data window. Here’s another great data feature that’s not well known but extremely helpful. There will be times when you’re not sure what values are considered good or bad for an item. Or you may simply want to have a visual view of how the data values are distributed across all the stocks in the universe. From the main page, select a Category and an Item as you normally would when building a screen or report. After left-clicking Item Summary, an Item Summary Window will pop up. Now you can see how an item’s values are distributed across all the stocks in the universe. This display groups the values into equal ranges around the item’s mean value. Each bar represents the number of companies within a certain range of values to visually show how the items data values are distributed amongst all the companies in the universe. 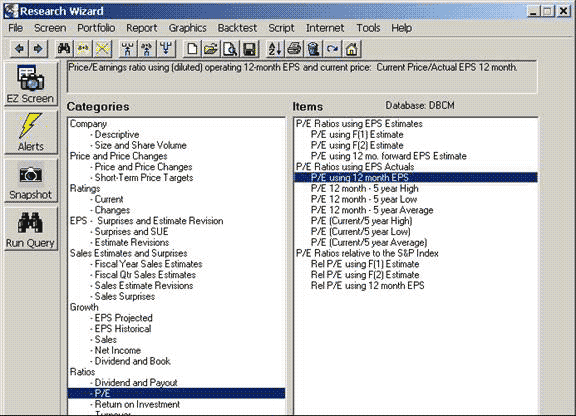 The Item Summary Histogram Table has three rows. The first row contains the segments of the values range. The second row contains the number of companies falling within the particular range. The third row shows the percentage of companies within the particular range. The next time you’re building a screen and are wondering what value to use, take a look at the Item Summary window to see how that item is distributed over all the other stocks in the universe to get a point of reference. This article wouldn’t be complete without mentioning how to access the Zacks Company Snapshot reports which feature key decision making information. 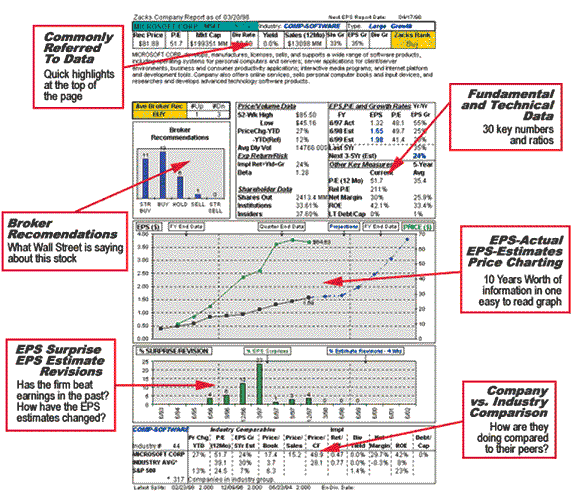 This color report includes a company description, actual and estimated EPS, company vs. industry ratings, fundamental data, broker recommendations, price charts and the Zacks Rank. Click on the Snapshot button on the left side of the program. 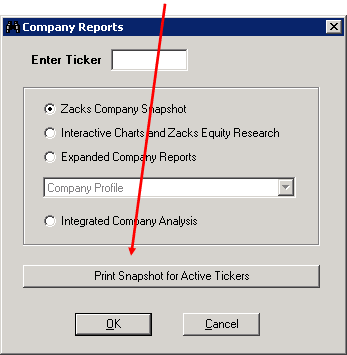 Once the Company Reports window pops up (below) type in a ticker symbol in the Enter Ticker box. Some of the most Commonly Referred to Data in the Company Summary Table at the top of the report. Access other Key Measures in the Fundamental and Technical Data window. See what Wall Street is saying about the stocks in the Broker Recommendations section. Beneath that chart is the EPS Surprise and Estimates Revisions graph. And at the bottom of the Snapshot there’s a Company vs. Industry Comparison table where you can instantly size up a company compared to its peers. View these reports through the program or print them for reading. 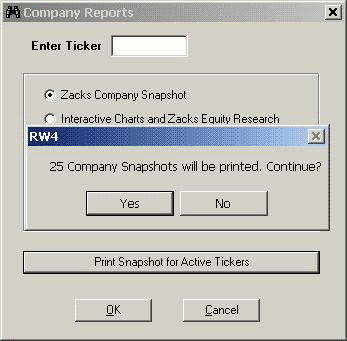 As a convenience, you can also print up multiple Snapshot reports with a single click of your mouse. Just run a screen or open up a portfolio. Snapshot Reports to print up. 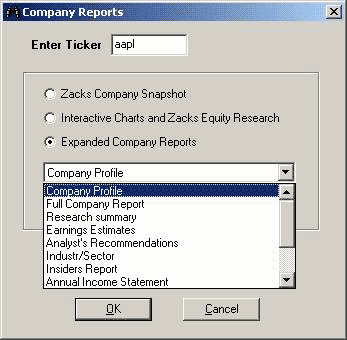 When the Company Report window pops up, type in a ticker and then select the Expanded Company Reports radio button. From the drop down box, you’ll be able to choose from many different reports. Click on any one of the reports and then click OK and they will open up in a new browser window. Below is a sample of one of the Expanded Company Reports. 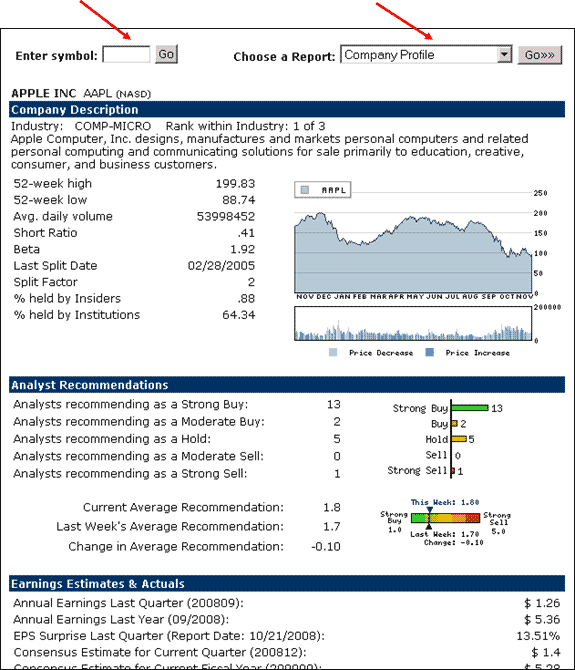 This one depicts a screenshot of the Company Profile report. Once you’re on this page, you can access any of the other reports from the Choose a Report drop down menu. 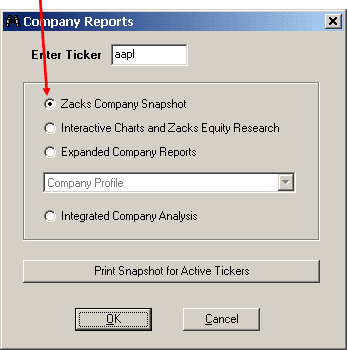 You can also look at reports for different stocks by typing in a new ticker in the Enter Symbol ticker box. 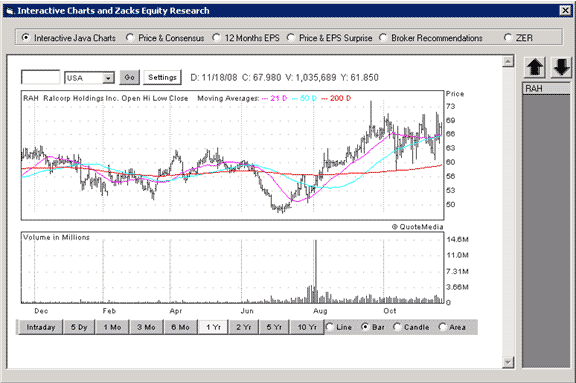 You can also access the Interactive Charts and Zacks Equity Research reports from the Company Reports window as well. 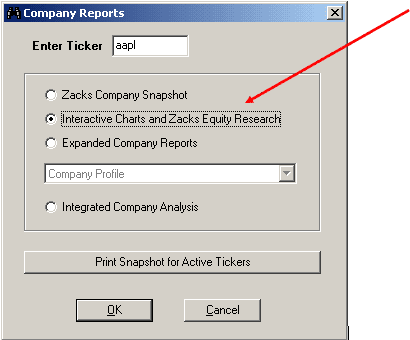 When the Company Report window pops up, type in a ticker and then select the Interactive Charts and Zacks Equity Research radio button. team of senior analysts. Just click on the radio button next to ZER. written description on the company. 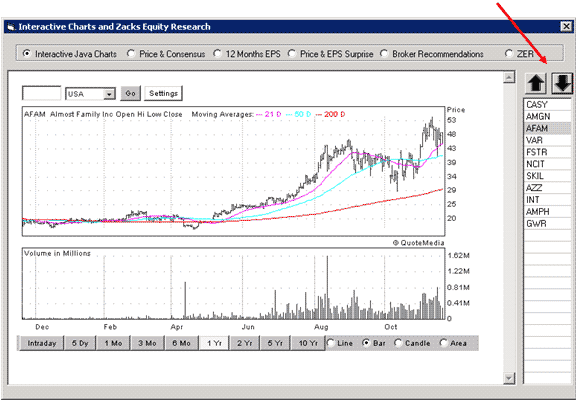 Note: You can also pull up the Interactive Charts and Zacks Equity Research window from the report page. Just run a screen or report as you normally would. report’s tickers are listed on the right. To scroll through the list, click the Up and Down Arrows on the right. If you have the optional Zacks product, Integrated Company Analysis (ICA), you can have an instantaneous link to that module. 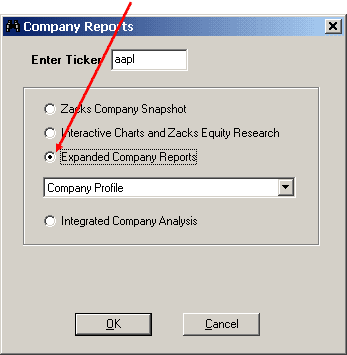 When the Company Report window pops up, type in a ticker and then select the Integrated Company Analysis radio button. 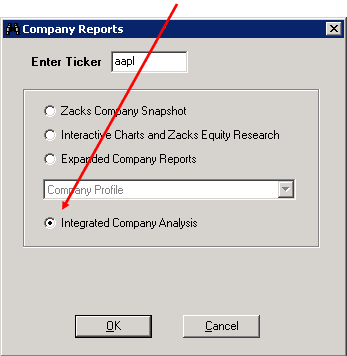 Click the OK button and the Integrated Company Analysis program pops up in a separate window. With the Research Wizard, any data is no more than a few mouse clicks away. And with the Quick Tips featured in this article, you’re now ready to get your information even faster.